We visited Mount Rushmore on a beautiful cloudless day. The startlingly blue sky behind the carved white heads was a postcard moment! The memorial is well-designed so visitors may walk as much or as little as they want. That's good because the temperature was in the 90's and the park is popular with people of all ages. The memorial is very moving. The film about planning, carving, and dedicating the memorial is excellent and adds to its appreciation. I enjoyed visiting the artist's studio which contains a model of the project. It was interesting to note that the original design included clothing and hands, but it turned out that the rock wasn't strong enough to support these elements. The biggest surprise was an evening drive through nearby Custer State Park. As the car topped a hill, we saw a ghostly image seemingly floating through the trees. It was Mount Rushmore about five miles away illuminated for the evening show! As we got closer, the image became clearer but the rock and sky were dark and indistinguishable so the image still seemed to float! 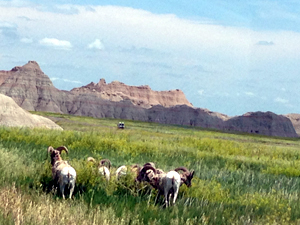 We also visited Badlands National Park. The formations are spectacular! The highlight was a group of five male bighorn sheep. When they moved from the road, they disappeared because the grass was so tall! Stephanie K. Wade has practiced Trademark law for over 30 years. Ms. Wade has extensive experience in domestic and international trademark issues, including international trademark licensing, trademark piracy and trade dress issues. 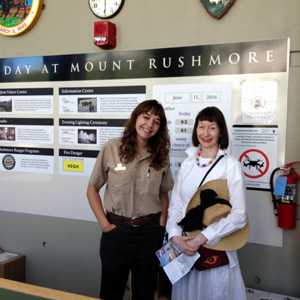 Ms. Wade is a frequent visitor of our National Parks and has a keen interest in supporting the preservation of these Parks.